Her name is Rithika Merchant. Roughly translated, for those who wonder what Rithika means, the name stands for “a woman for all seasons.” Born in 1986 in Mumbai, India, she had artistic inclinations from an early age. Art has always been a common topic of discussion in her home, although none of her parents were artists, both being doctors. Visits to art galleries in the city were routine and often Rithika draw with her mother. Her childhood drawings were beautifully framed and hang till today on the walls of her family home in Mumbai. It is difficult to say in words what makes somebody become an artist but Rithika felt that there is nothing else that would like to do in life. So, she became a painter. In 2004, when she was 18, Rithika moved to New York to study at Parsons The New School of Design. She graduated in 2008 and the experience has been amazing, molding her thinking and artistic expression. As opposed to the technical standpoint, The Fine Arts program at Parsons favors the conceptual aspect of art making. Not incidentally, they require that you take an art history course. This was essential, because it made her realize that the ideas embodied in the artistic process can often be more important than the effort to make a technically perfect work of art. Furthermore, it gave her the courage and ability to explore and experiment with different things, before reaching the form of expression seen in her paintings today. Rithika always liked to travel and see the world. While she was in college, she studied for six months in Paros, Greece and spent three months in the Galapagos Islands of Ecuador teaching an art course to local children. Her wish to see the world did not cease even after graduating, when she applied and was accepted as Artist-in-Residence at the ”Convento SaoFrancisco de Mertola” in Mertola, Portugal. After spending three months in the desert region of Alentejo in the rural Mertola of Portugal, she moved to Lisbon and decided to pursue a career as a visual artist. During her stay there, she met her future husband - François Mahu - a Belgian who was in Lisbon, as an Erasmus Student. After a year together, the young couple moved to Belgium and in January 2010, got married. Soon after, they moved to Barcelona, where they live and work today. 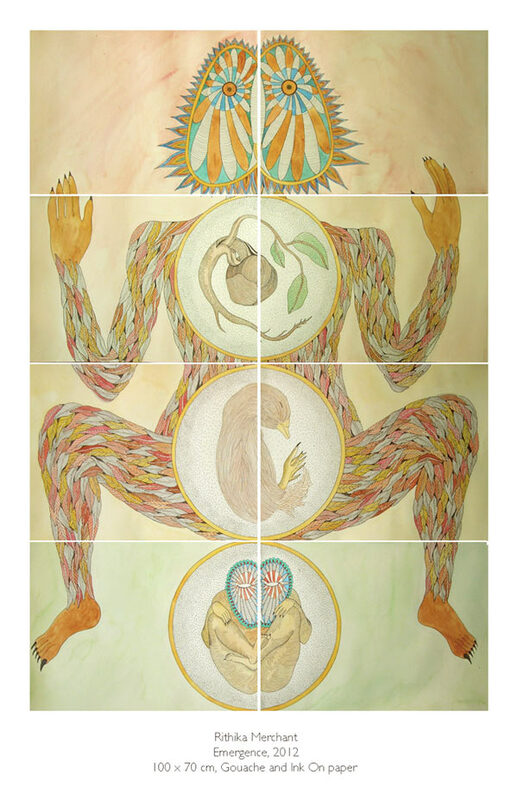 Inspired by the Portuguese hand painted tile murals, Rithika started a series of paintings called “Origin of Species” and “Comparative Mythology.” During the stay in Lisbon, she noticed these murals everywhere. Called ’Azulejos’ they are a big part of Portuguese culture and architecture and can be found on the interior and exterior of most building and houses. They are extremely beautiful and usually depict historical and cultural events. The Portuguese tile murals inspired also the idea of joining individual pieces to form an image, as if arranging a puzzle. Another reason for doing tile like arrangements of her paintings is that working with fragments allows making large-scale work in a very small space. Rithika started the work on this series of paintings while traveling on trains and buses or living in the limited space of a small house. The vision for her work takes the shape of a patchwork quilt of different world experiences, which inform and inspire each other. 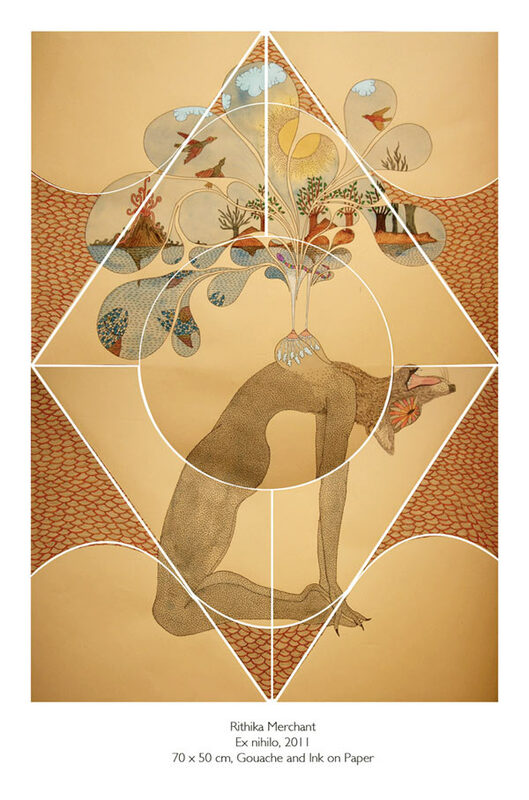 The art of Rithika Merchant relates to the environment, cultural pluralism and intimate travel experiences with focus on the emotional complexes and relationships between people and animals. Most of the creatures depicted in her paintings are hybrid creatures in a discrete state of development or fusion, a state embodying the duality that is within everything in nature. Her creative process includes the idea of many selves in conversation with one another. Mythological motifs, recognizable across cultures, provided her with a stable base from where the narrative of her painting took root and grew. Rithika’s interest in folklore came mostly from books. One of her favorite books as a child, was an illustrated book called “Gwinna,” which is about a girl with wings who is led by a small white owl that teaches her to fly. Furthermore, the “Golden Tales from the Arabian Nights” a book with intricate illustrations by Gustaf Tenggren. Both books have shown that a painting can illustrate a story or a concept, which is something she still thinks about when making art today. In short time, Rithika Merchant’s art and interest in cultural pluralism attracted a lot of attention around the world, from United States to Spain, Greece or India to Portugal , Belgium or Italy and recently Romania. Between 7 to 16 July 2012, Merchant Rithika, “a woman for all seasons” will be the guest of the International Symposium of Painting from Gărâna, Romania. Curated by the internationally known artist Elisabeth Ochsenfeld, the symposium welcomes every year artists from all over the world in one of the most picturesque places from Romania. Multumesc pentru comentarii. articolul in limba romana a fost publicat pe "ora de timis" , linkul se afla sub fotografia artistei. Consider ca RM este un artist deosebit. Ganduri bune pentru aprecierile Dlui Horga Mihai si Dnei Eva Maria Salvanu Cojocaru, multumiri celor care au pus un like sub acest material. Wonderful, that this artist came to exhibit here, really a very personal style, a great value, congratulations for the very young artist,Ritika Merchand, for the well documentated article wroten by Adriann Ionita. Congratulations again.